Nigeria has continued counting ballots in its presidential election, with the incumbent Goodluck Jonathan facing a strong challenge from former military ruler Muhammadu Buhari. The election commission (INEC) said it hoped to announce the winner on March 30. 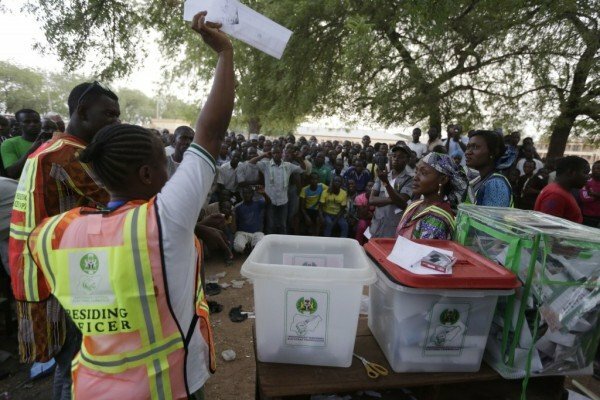 Voting was extended until Sunday in some parts of Nigeria after problems with new electronic card readers. President Goodluck Jonathan was among those unable to cast his vote using the technology, which was introduced to prevent fraud. The INEC chair, Attahiru Jega, stressed that only a fraction of the 150,000 card readers being used nationwide had failed. The vote had been delayed by six weeks because of the insurgency by Boko Haram militants. Ban Ki-moon said in a statement voting had been “largely peaceful and orderly”. There has been tension in the southern Rivers State, where thousands protested against alleged killings of opposition workers and voting irregularities. The PDP has dominated Nigerian politics since 1999, but Gen. Muhammadu Buhari’s All Progressives Congress is viewed as a serious challenge. Voters have also elected members of the House of Representatives and the Senate.